Well here we are once again ladies and gentlemen: about to enter a new summer filled with flowers rising to bloom, beautiful skies over this city of ours, and it's just about time for my yearly offering of twenty-seven homemade chocolate chip cookies to the monster who lives under my bed. My seven year old self signed that 'don't eating me please' contract with ol' Mr. Snagglepuss and, well, I'm still a girl of my word. I wonder if he'd like oatmeal this year? First of all, I'd like to apologize for not posting in so long. I somehow managed to dump myself into some bushes while rollerblading down at Bayfront Park, and spent a few weeks in a cast as a result. I'm more than fine, and things are back to normal almost everywhere - except I've got some serious catching up to do on my internetly duties. New pictures, new pieces, and new things to chat about... lots of new. Tonnes of new. Big gigantic barrels of new stamped with big block letters "new", and on the back, "nouveau". Also, the barrels have that new car smell. Which, somehow or another, brings me to my big news for today. Last year I had the honour to participate in the first annual Stoney Creek Studio Stroll, and since they were such a fun group to work with, I'm happy to announce that this year I've been invited back to participate in the second annual Stoney Creek Studio Stroll! What is it exactly? Well, it's nine of what I think are Stoney Creek's finest artists, some established and some emerging, spread across seven locations - one of which happens to be my own studio gallery. This year we've pulled together a diverse collection of artists, each bringing their talents to an even more diverse collection of artistic mediums. "Who exactly is participating?" I'm sure is your next question, shoes on and halfway to your car - here I'll interject and remind you that the Studio Stroll doesn't start till May 31st. Shoes off, feet up, you have a short while yet to relax. I could tell you about each artist, but it might be best to explore their websites on your own to get a clearer picture of who they are, and what they bring to their work. So without further ado allow me to introduce in alphabetical order: Margaret Dent, Kelly Lowe (Me! ), Sophie Martineau, Sez Nalsok, Tara Pasher, Tim Russell, Melissa Stewart, Josh Tiessen, and last but not least: Jacqueline Venegas. I really do hope many of you drop by my studio to see me and my work (as well as Tim Russell's, whose fantastic photography will be adorning my walls for the Stroll). Events like this are a fun way to meet some of your local artists, see some great work, and support a great cause... which I seem to have forgotten to mention! If you bring a food item for the Stoney Creek food bank, it'll get you entered into a full SEVEN draws for a chance to win some really fantastic prizes. Overall it's gonna be a great day, and I hope each of you finds something that brightens your day. 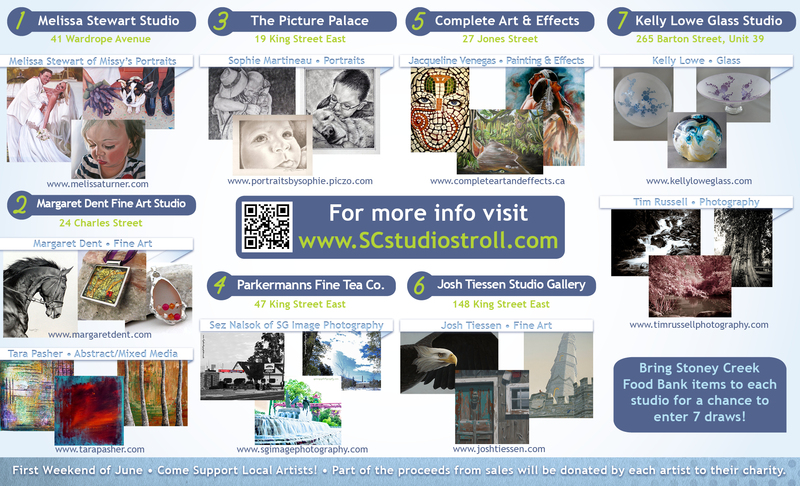 So come support your local artists and your local food bank by participating in the Stoney Creek Studio Stroll, on May 31st to June 2nd. 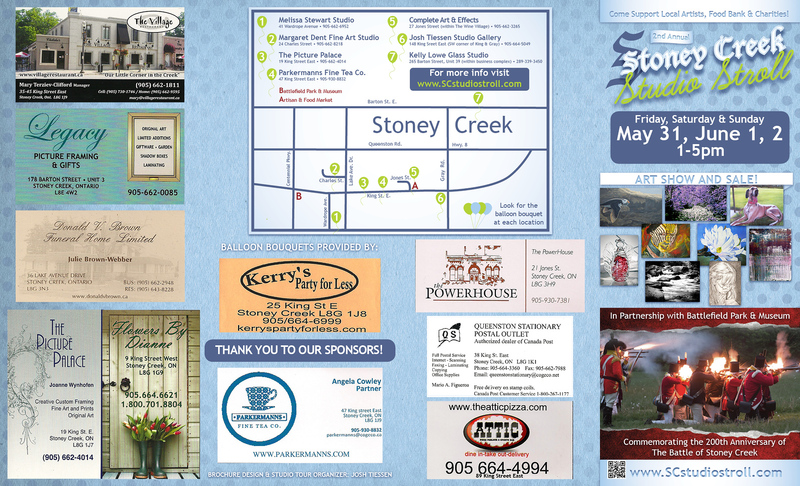 For more information, you can check the Stoney Creek Studio Stroll's main website. My annual holiday season open house. Basically a chance for the community to come on down to my studio and enjoy a nice coffee and snack while having a look at what I've been up to this year in the glassblowing shop. I always make lots of ornaments and other great gifts for this show too, so it's a great chance to get some of that Christmas shopping over with. December 1st and 2nd, 2012, 10:00 to 5:00 each day. November 12th 2012 - My New Online Store Is Open! Have you ever had a night like this? You're sitting at home, staring at an end table thinking: "There's something missing from that end table. Maybe another lamp... FOUR lamps maybe! No wait, that''d be ridiculous. 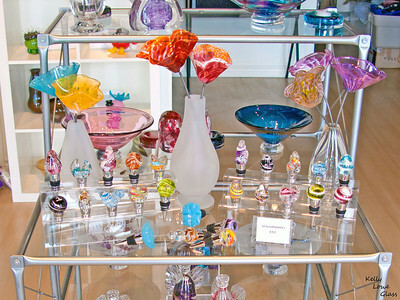 Glass art, now THAT'S where the action is! If only I could order some spiffy new glass art from the comfort of this couch, because a repeat of Seinfeld is coming up and I don't wanna go outside right now. This dilemma saddens and potentially enrages me!" Well, do I have news for you! Brand spankin' new and ready to solve your non-couch-leaving woes, my new online store is open for business! It's been a while in the making, but I thought it was time to take the plunge into the late 20th century and offer some of my work online. Now not everything will be available for purchase in the new store; some pieces are simply too large or too heavy to make shipping a reasonable option, but if you poke around maybe you'll find something you like. Ready to click on some things? 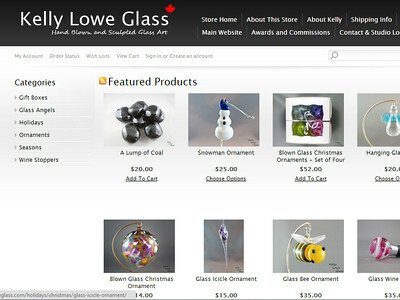 alright, let's start with this one: Kelly Lowe Glass' Online Store (link opens in a new window). I hope you enjoy it, and as always I welcome any feedback you might have. November 5th 2012 - It's Beginning to Look a Lot Like... Ornament Time! November... just where does the year go? One day I may mount an Age of Discovery style expedition to find out, if I can find a willing monarch to sponsor the sure to be epic sea voyages it would most assuredly entail. Until then however, I'm still left at the whims of time, and time has brought me to... this moment right now. Oops... I mean this one... or wait, it's probably this one. Yup, it's this one for sure, I remember that odd looking cloud over there. 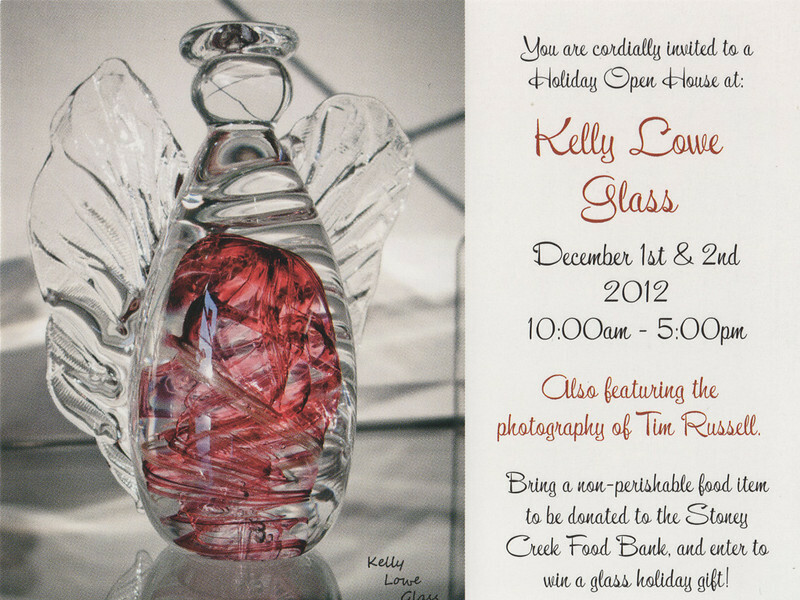 So what does November mean for Kelly Lowe Glass? It means winter is coming, holidays are almost here, and there are lots of things to be made. In particular, one of my staples for this time of year are my traditional hand blown ornaments (All links open in a new windows) I've been making for almost as long as I've been a glassblower. Last year I had the honour of being in a film by Cineplex Entertainment (link goes to an article in the Hamilton Spectator) in which I was able to invite moviegoers across the country into the hotshop to see how I make these ornaments, which was a lot of fun - and a little nerve-wracking! This year I'm just focusing on enjoying the season. I'm a big Christmas girl at heart: my siblings and I are scattered around Southern Ontario these days, but we all return home to Mom and Dad's for the holidays. It's rare for us all to be together at once these days, and so to me that's what this season is all about: all of us being together and enjoying each other's company. As far as the studio, I've been making ornaments - I actually make a variety of styles, and encourage you to check out my Holiday and Special Occasions gallery here on my site, and if you're interested in seeing more ornaments after that, I've made a gallery of just ornaments that you can poke around at too. If you're interested in purchasing my ornaments, well you have a few options now! First of all, you can always come into my studio gallery during my open hours (2:00 - 6:00 on Tuesdays and Thursdays) - we can chat, I can show you my work, and I even have some tasty coffee I'd be willing to share. Next is a bit of a tease of a tease for the future: I'm working on a fully functional online shop as part of this website, where I can offer some of my smaller pieces direct from me to you. It's not ready yet completely ready and available as of November 12th, 2012! Please allow me to extend a personal invitation for you to poke around and pass merciless judgement on my interweb store making abilities (don't worry, I paid professionals to set up everything that has to do with transactions and the security side of things). Next time Amazon wants a facelift, they know where to find me! Check it out at Kelly Lowe Glass' Online Store (link opens in a new window), and please let me know your thoughts. Last but definitely not least, there are some fantastic galleries throughout Hamilton and Southern Ontario who have graciously agreed to host some of my work, including some ornaments. I definitely encourage you all to go and check out your local gallery, and see what your local artists are working on. I guarantee you you'll be impressed. Well, that's it for... doh! I forgot the thing that actually got me off my duff to write this post! If you look to the top left of this post (or here if you like your pictures large) you can see a picture of my ornaments in a box. This year, for the first year ever, I'm offering my ornaments in a box of four (you can still buy them individually of course), making them much more convenient for gifting and the like! 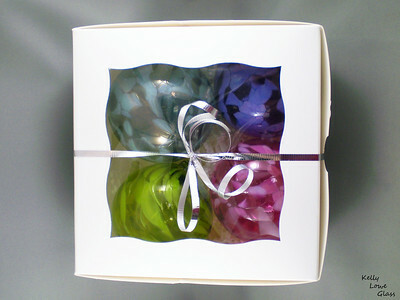 The boxes have a bit of ribbon, as you can see, and a sticker declaring them 100% hand blown glass made by a particular artist whose first name begins with "Kelly", and whose last name happens to be "Lowe". For those of you in the Midland region, I'll be offering some of my handmade glass art for sale at my booth at the Victorian Christmas Show. For those of you who can't make that, or even if you could, I'm also planning on having an open house at my studio gallery in Stoney Creek/Hamilton on December 1st and 2nd. Great time to pick up some gifts! As Fall quickly approaches I find myself once again taking inventory of my art with a very critical eye: which pieces will I make again, which will be changed in some way to bring them closer to some arbitrary ideal, and which will be retired to that big glass palace in the sky? It can be a difficult process, an emotional one even, to turn a piece over and over in your hands debating whether to continue with that design or move forward with a new one. I made each of these pieces with my own hands, and each is the result of a great deal of thought, planning, and hard work. The reasons I choose to retire a piece can vary greatly - from expense (some designs can be so prohibitively expensive for me to make that pricing it properly so that it will find a home with someone who will enjoy it without breaking either of our bank accounts can very be difficult) to the availability of certain materials, to simply freeing up some hotshop time so that I can experiment with new ideas and techniques to further my craft. It's a process all artists have to go through in order to constantly present their best, and to grow at what they do. I have a photographer friend who does it this way, on advice from an old instructor: he went through his photographs to find what were, in his mind, his top twenty-five. He took these photos and put them in a file on top of his bookshelf. Then, each month he takes that folder down and looks through the folder with the purpose of choosing one photograph to remove. He can add another photograph, but only if he truly believes that it is a superior shot to the one he was removing. His idea and motivation for doing this is simple: if you accept today's best as the best forever, the motivation to improve becomes harder to find. By realizing and forcing yourself to be constantly upgrading your skills and efforts the final quality of your work WILL improve, and your collection will improve. If not enough effort is put in then your work will plateau, and you'll be able to see this as your twenty-five best dwindles with no new additions. A barometer for artistic growth, you could call it. I leave such fancy talk to my photographer friend though: I'll just call it cleaning out my back room and storage. Beyond that I've spent a lot of my Summer exploring a slice of what Hamilton offers in terms of the art world. I've visited potters, painters, photographers, galleries and art shows; damaging my pocketbook at each as my personal collection of local artists grows. On each of these excursions my appreciation for the diversity of Hamilton's art scene has grown tremendously, and I encourage you all to get out there and check things out... I think you'll be glad you did. Summer is a slower time for glassblowers, the oppressive heat from our furnaces become downright dangerous when combined with the high heat and humidity of our Ontario Summers. Even with a slowed schedule things have been busy, and I've had the chance to design and make a new piece: small solid glass birds containing swirls of colour. To the top left of this post you can see a quick picture I took of one of my birds, and if you're at all curious I encourage you to come down to my shop and have a look for yourself, as well as check out all the other new pieces I've been working on in the last few months. I've even picked up one of those Keurig-brew-a-mug-of-coffee-in-45-seconds things for the shop, so I can contribute to the "keeping my customers caffeinated" cause. I suppose that's it for now. I have a whole bunch of new award designs I want to share, but I think I'll leave those for another day. I hope you're all enjoying your September, and see you next time! So I turn my back, and suddenly it's summer. It feels like only yesterday I was dreaming of having enough snow on the ground to make my snowshoes a practical bit of fun rather than just a bizarre fashion accessory. I remember driving to the hotshop and thinking "these trees will be beautiful when their leaves sprout... too cold for that yet." I remembered those days fondly this week as the temperature topped 40 degrees Celsius (after the humidity was factored in) while I was working in the hotshop: the furnace blasting its incessant heat, molten glass a few centimeters from my hands. What I'm saying is that it's hot, and Kelly Lowe Glass needs a waterboy I think, and probably a few handsome individuals to fan me while I work. Also, while I'm dreaming, maybe there can be a nice little lake outside full of friendly baby elephants, swimming and spraying each other in gleeful play. Probably a dolphin or two should be in there too, and of course they'd all welcome me with open arms when it comes time for a breaktime swim. So what does a glassblower do when the Summer heat rolls in? The same thing she does the rest of the year really, except there's a whole new natural environment to see and take inspiration from. This year I've been really impressed with the splash of botanical colour the city of Hamilton has been blessed with recently: flowers, flowers everywhere! With each turn of a corner bringing into view another flowerbed in full bloom, I decided early this year that I had to design some new pieces inspired by what I was seeing. I've designed glass flowers in the past, and have usually gone with a more intricate literal approach: the petals individually sculpted and attached hot to a small core that grows with each petal into the finished flower. Examples of this style can be seen here and here (all links open in a new window). I really enjoy creating these flowers, and am very proud of how they look. I'll definately continue making these the same way as I always have. But I also wanted to design something less literal, perhaps somehow working in a stem to allow it to stand naturally within a vase or display. So with the general design in mind I sat down to work on the challenges inherent in what I wanted to do. My primary challenge was the idea of having a stem. A long thin piece of glass would be possible, but not ideal: I wanted this to be a piece that could be "well loved" - kept and used again and again for years to come. Going all glass meant certain care considerations for the owners of these flowers, and that was something I wasn't really satisfied with. So I decided to go the mixed media route, and settled on using a welded metal rod as the stem. By going with the metal I felt free to play a bit with combining the organic, flowing shape and colours of the glass petals with the bold industrial effect of the metal rods. One of my favourite results of this is that the inside core of the flowers is a welded metal washer - something I personally find quite striking, and think it adds something very interesting and unique to the piece. Click here to see what I mean. For a picture of the glass flower petals from the side, click here, and to see a few examples from a couple steps back and placed in vases click here. In addition to creating these new flowers I've been experimenting with attaching sculpted leaves to my classic flowers to create a more "whole plant" appearance... you can see an example of the results here. Lastly, I suppose I should mention the fact that I do make flower wine stoppers as well, a pair of which can be seen here. Talked about the heat? Check. My flowers? Also check. Looks like I'm about done here for today! I encourage you all to come down to the studio (open Tuesdays and Thursdays, 2-6pm) and see all of the changes and new work I've been up to. Hope you're having a fantastic start to your summer! A friend visiting the hotshop a few weeks ago brought along his camera and, in an effort to help me become the world's dirtiest hand model, took the picture accompanying this post. While he grumbled about how blurry it was, I saw instead a neat picture that could help me convey something interesting about my art: how low tech the entire process really is. While the world has marched to the quickening pace of technology, innovation, and progress, glassblowing has remained connected firmly to its roots. If I had the chance to invite a glassblower who lived and worked a thousand years ago to my shop, s/he would immediately recognize and be able to use almost all of the tools I use to create my art. I often imagine that if we were moved to do so my new glassblower friend and I could within minutes of meeting be working on a piece together. Probably a Kritter, since how much fun would that be? 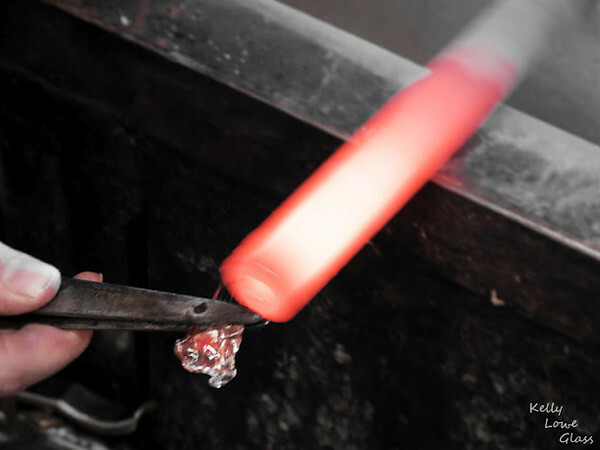 The picture, for those who are wondering, is of me removing the leftover molten glass from a blowpipe after finishing a piece. As you can see it's a pretty simple and low tech job: a pair of shears or pliers, some digging, and a bit of practice is all it takes. Almost all of what I do as a glassblower is similarly low tech; there are no timers, molds, or any other fancy doo-hickery involved. To me, this is one of the most incredible things about being a glassblower: a piece's success or failure (will it be a beauty or a beast!) relies on my being in tune with the piece I'm currently working on, being able to feel when a piece needs to be reheated, knowing how colour and glass react to extreme temperatures and other things that can be perhaps summed up as "experience." Each year I work with glass I find myself a little more connected, and my artistic intuition more reliable. The process may be low tech, but that doesn't mean it ever becomes boring: working in the hotshop is still the highlights of my week, and as my experience grows so too does my appreciation of this wonderful artistic medium - its history, the process, and how blessed I feel as I lie down each night knowing that tomorrow I get to wake up and be a glassblower too. March 18th, 2012 - Call Me Madam Ambassador! Or Kelly, That's Fine Too. Well folks, it's official, I have been selected as the Arts Ambassador of the Year by the good folks over at Tourism Hamilton! I received the honour at the 14th annual Tourism Hamilton Awards which took place on Tuesday March 6th at the Hamilton Convention Center. I'll be honest and say that when I first heard I was nominated for the award I didn't really expect to win. I had a huge year last year, the biggest yet actually, taking my art onto television, theater screens, and opening up new avenues on this here internet to communicate with customers and art fans alike through this website and other social media sites. But more importantly I have continued to further my art, pushing myself harder and further in the hotshop each day in an effort to continually grow my skills as a glassblower. So I had a big year... but it's a big city, and so many fantastic things happen here in both business and in the arts, and so I was content and honoured just to be nominated. When I found out I had won, shock is the word I'd use to describe my first reaction, then gratitude for every opportunity this city has given me, and then finally terror: I was going to have to give a speech! I'm sure my seventy-five word speech and I will go down in Tourism Award history as the most noticeably nervous recipient and the one who looked least accustomed to dressing formally. Thankfully everyone involved with the event was supportive, friendly and welcoming - the other nominees, the attendees, the fine folk who made the evening happen, they all came together to make me much more at ease and I ended up enjoying the night greatly. I'm blessed to be able to do what I do for a living, and to do it in a city such as Hamilton makes it an even more rich and fulfilling experience. Thank you to everyone who makes my career possible, and to everyone at Tourism Hamilton: I'll continue to do my best to make this city proud. For those of you interested in reading the article next to this post I have a much larger scanned version on my media page. A note before we begin: to all of you who found your way here via my constant promotions on www.how-could-you-not-love-aardvarks.com, could you please follow me this way to what I like to call my 'Room of Fantastic Aardvarkian Delites'. Come on in now, don't be shy... Look at that nice "I Love Aardvarks" poster on the wall - doesn't that make you feel all at home and safe? Are you all the way in now? Good. Just let me get the door... HAHAHA! Why am I locking you in? Bait and switch baby! You better hold onto your seat for some glass art news, baby! So what sort of news do I have for you, my oh so captive audience? (Stay away from that airvent! It's much too small to crawl through.) Well the big news on my mind at the moment is that someone out there saw fit to nominate me as Hamilton's Art Ambassador of the Year. As a nominee I get to attend a rather fancy gala, wine and dine with some rather interesting people who help to make Hamilton the great city it is, and eventually sit nervously while hoping it's my name called when it comes time to present the awards. Dress? Check! Jewelry? Check! Shoes? Check! Butterlies in my stomach? Double check! The dinner and award ceremony is this Tuesday, March 6th, so for those of you with some extra fingers just taking up space I'd appreciate it if you could cross them for me. I also want to say a big congratulations to all the other nominees: it's an honour to share this event, and this city, with you all. 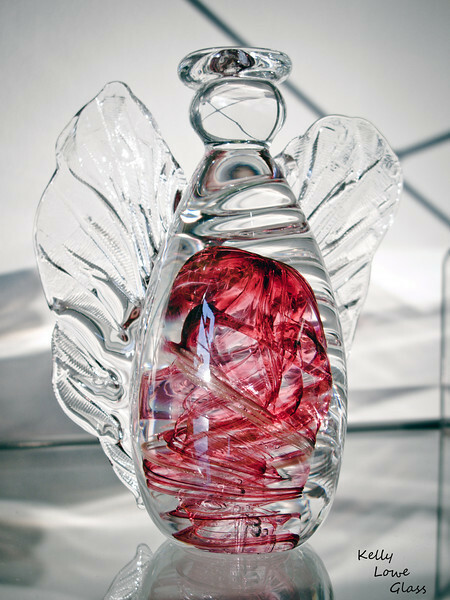 The other big news is I've been working like a hardworking aardvark (awww... you guys thought I forgot about you...) on some new designs, including the brand new glass angel featured in the picture used to kick off this post. I also made some new bowls, new paperweights, and much much more. If you're interested in checking out my latest pieces you're welcome to come in and visit me at my studio... I'm here every Tuesday and Thursday from 2-6, and of course by appointment if you can't make those times. That's all I've got for today. I hope you'll wish me luck at the awards! P.S. - Aardvark lovers, I feel kind of bad for deceiving you like this, so you guys are all welcome at my place for a screening of Disney's 1967 classic "An Aardvark Commeth." I'll start some popcorn, and I believe if you check the door to your room you'll find it is now unlocked. Now get up here for some nocturnal earth pig action! 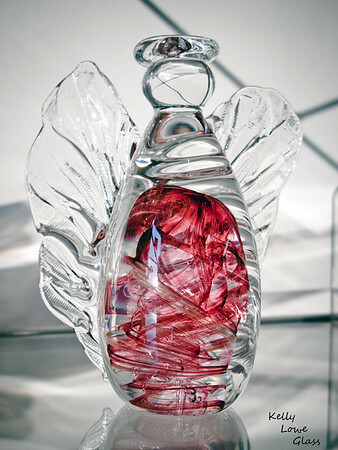 Glass Angel with red swirling colour. Handmade by Kelly Lowe of Kelly Lowe Glass. Kelly Lowe of Kelly Lowe Glass uses shears to remove hot glass from a blowpipe used in glassblowing. 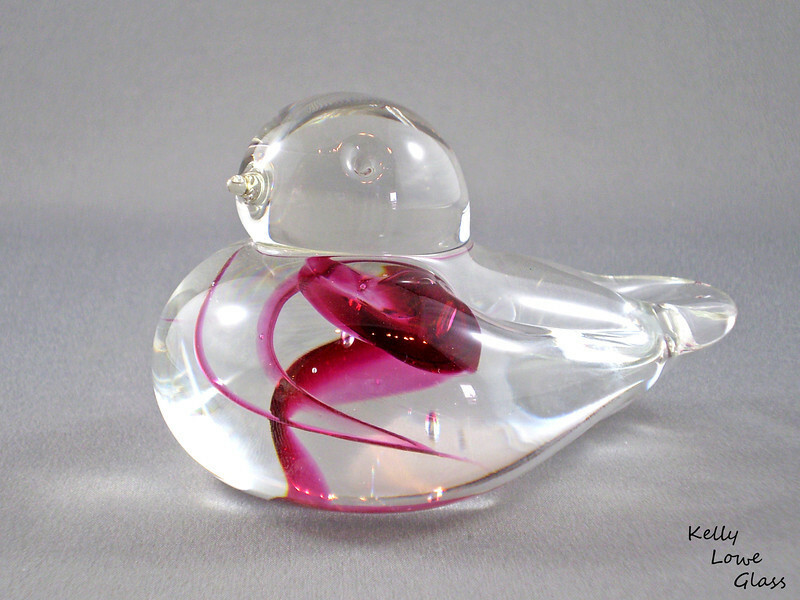 Handmade glass bird by Kelly Lowe Glass.